The idiot of the headline is me in the sense that I am not an economist and have never had any formal association with study of the theory and practise of economics, but… I began to understand why what is today called Western capitalism was bound to crash way back in the early 1970′s when I was researching and producing an epic documentary on the everyday reality of global poverty and its implications for all. When I reflected on what I had witnessed and learned while researching in 120 countries (as well as at the World Bank and many UN agencies) and filming in 69 of them, I let commonsense be my guide. It led me to the conclusion that capitalism was not of itself the problem. It was the short-sighted and stupid way Western capitalism was managed. Now I’ll put some flesh on that bone. By the early 1970′s truly informed development experts were drawing attention to the fact that our one small planet was divided into two worlds – the Rich World containing about 20% of humankind (and known in development jargon as the North), and the Poor World containing about 80% of humankind (and known in development jargon as the South). The rich nations were creating their wealth by selling goods and services. It followed that if this wealth creating process was to have a sustainable future and Rich World citizens were to enjoy ever rising material standards of living as promised by their politicians, the global market place needed more and more consumers with the purchasing power to buy what the Rich World nations had to sell. If the necessary investment had been made over 10, 15 and even 20 years, (it would have needed that amount of time in order to guarantee that the money and other development assistance provided could be absorbed and put to best use with minimum corruption), victory in the war against global poverty and underdevelopment – the only war that matters – would have been assured. To give just one example… The disastrous population drift from the rural areas where there was a future to the urban centres where there was not and is not a future for many of the drifters could have been halted and even reversed. Making the investment needed on the necessary scale would have meant that the investing Rich World nations would not have grown so rapidly and their citizens would have had to accept a little less in the way of ever rising material standards of living, but that would have been a small price to pay for giving Western capitalism a sustainable future and all of our children wherever they live the prospect of a future worth having. (Whereas today they do not have a future worth having). There was bound to come a time when Rich World citizens simply could not afford to go on buying on the scale needed to keep Western consumer capitalism going. Then, partly to fuel debt-driven consumer and government spending, the greed-driven, totally irresponsible bankers drove the final nail into Western capitalism’s coffin by playing their leveraging games, producing debt instruments with a face value of hundreds of trillions of U.S. dollars but which were not backed and supported by real assets. (A good friend of mine was the senior risk manager for one of the world’s biggest banks headquartered in London. She told me that for five years she and her team tried to warn top management that leveraging with Mickey Mouse instruments was creating a catastrophe, but top management didn’t want to listen. It was focused only on bonuses). There’s no question that banking chiefs were short-sighted, greedy and stupid, but… They were not the architects of what future historians will call the crash of Western capitalism. They, the architects, were the politicians who deregulated the banks and financial markets. 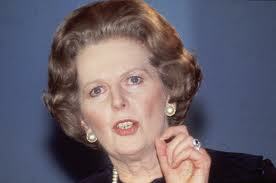 The leading architect was Britain’s Prime Minister Margaret Thatcher. On 27 October 1986, she initiated the “Big Bang” in the City of London, the sudden deregulation of the banks and financial markets. In the name of “financial liberalism” she truly believed that markets would work better, more efficiently, if they were free of rules and restrictions. In her view millions of decisions made every day by traders in a free market would be better for all of us than decisions that had to be made with reference to rules and regulations drawn up by committees of the great and the good. Events were to prove that she could not have been more naive and more wrong, but before they did American presidents starting with Ronald Reagan had followed her lead. My understanding of the situation today can be summarized as follows. The debts of Western governments are so big that no Western country will be able to generate the growth and so the money needed to repay them. On that basis I can see only two scenarios for the future. In the other scenario all debts, including mortgages on homes, are written off and we all start again. By definition a re-start would have to be based on a rock-solid commitment to fairness with a real intention to make capitalism work for the benefit of all. This idiot is in quite good company. American Martin Weiss is the founder of the Weiss Rating Agency (WRA). In his latest presentation he makes the following claims about his agency’s astonishing success in predicting economic disasters of the past 40 years, a claim which is confirmed by all the major American newspapers and economic journals. Months in advance WRA warned about the S&L crisis of the 1980′s; the great insurance company failures of the 1990′s; plus the great “Tech Wreck” of the early 2000′s. WRA was the only firm in the world to warn of the financial crisis of 2008 more than a year in advance, specifically naming nearly every major company that later collapsed. The world-changing event he is anticipating is a decision by China to stop buying U.S. debt, which will mean, he says, that America will no longer be able to borrow money; and that, he adds, will see the beginning of “America’s Financial Doomsday”. My own biggest fear which I have been expressing to friends in private for a number of years is that the unfolding economic crisis may take us all the way to World War 111. It could happen for two related reasons. One is the need of governments to deflect the attention of their own people away from the mess within. The other is the need to have an outside party to blame. There’s a case for saying that some American politicians are already setting up China for blame. European plans to bring in tough budget controls are irrelevant, even a farce. They are designed to stop the present unfolding catastrophe from happening again, but they won’t do anything to solve the present debt crisis. European leaders are shutting the stable door after the horse has bolted. This is quite a good analysis. I have always believed that the real cause of the crisis was precisely that the poor of the world are slowly but surely taking their destiny into their own hands. Since the wealth of the developed countries were based on the exploitation of the poor ones, the ending of that exploitation has to be accompanied by an impoverishment of the developed countries and the consequent need for those countries to find a new economic model. Thus, there is no "euro crisis" or "debt crisis". The crisis is systemic, but not in the simplistic and antiquated terms of the marxists, pipedreaming of old Karl rising from the dead as the new messiah and being born aloft on the shoulders of Lenin and Trotsky. I don't fear a war involving Europe, though. After all the blood that was spilt here in the 20th century, and all the anniversaries starting to come up, I don't think Europeans will be too busy contemplating the disaster war brought upon them ever go to war again. What the belliocse and belligerent Americans might do if their backs were to the wall is another matter. The footnote is, I'm afraid, rather silly. Of course the stable door is being shut! The horse has just bolted through the open door! A new horse is being got ready, but there is no point of putting it into a stable with an open door. The solution to the debt crisis will I think, be Mr Hart's second scenario: a large scale write off. Essentially, there is no alternative. But letting banks go bust just hurts their depositors, thousands and thousands of small people. Nationalising would be better than just bailing out and that too will probably be inevitable sooner or later. Thus, I'm very optimistic about the future of the world, Europe, the EU, the euro and even my personal future (I retire next week!). If the "South" had been educated and made a little richer, so they could buy "Northern" gadgets, then we would have one world instead of two. The "steady-state" would be a single set of manufacturers (capital) and a single set of consumers (North and south, together). After this happened, where would the next "growth" come from, a growth (in consumers) needed to sustain capital? And why are not today's consumers in the North enough to sustain today's capital? Something wrong here. If an economic steady-state is possible (and I'm doubtful that it is), then a purely Northern steady-state would have been possible. But in fact things are breaking down. If an economic sterady-state is not possible, then adding a large set of consumers via education and enrichment of the South will not create one. What might happen, however, is that the GROWTH of consumers by educating and enriching the South might sustain the growth-demanding capitalism for a while longer. After that it would either CRASH, as it may do now, or find a way to come into cooperative equilibrium with people, nature, climate, etc. Very interesting analysis of the present situation. Never having fully understood world economics(but then, who does? The experts all argue with each other),I wondered why we couldn't let the banks stew, and have a national bank to replace them, but then I thought I obviously don't understand it. So it's so refreshing to see Alan ask the same question. The comically eccentric Max Keiser, on Russia Today, has made similar comments. Very interesting Alan. I wonder what else your friend Edward Heath had to say on the topic of marshal law? It seems that the US is about to enter that stage. I also note that gun sales in the US has gone up 30-35% year on year for the last 2 years. The US FEMA camps are also about to go online; as personnel are now being sort to man these facilities; and lastly I am seeing more online comments from everyday people who are starting to get worried about their US zionist government. I would like to know what the future holds. I don't mean what it promises but a real crystal ball. It is a very worrying situation. At this point I am hoping at least that the worst will happen first in the US and from your post Britain; giving us Aussies a small chance at least of preparing for the zionist takeover. Alan, it is you who has it wrong! Hart: Events were to prove that she could not have been more naive and more wrong, but before they did American presidents starting with Ronald Reagan had followed her lead. Marshall: A better way to obtain proper behavior is to have misbehavors suffer the consequences of their actions. Regulation just invites a whole new category of misbehavors ... with more power than the misbehavors they are supposed to regulate. As long as we have a concept of "too big to fail" we have an ailment of "too big" ... period! This is not mitigated by making bigger. The root of all our problems is mismanagement of our medium of exchange. The most important result of this mismanagement is that INFLATION is not zero as it must be. A very sound article on the economics of the world, then and now. The "Steady State" concept is perfectly possible. However, the reason it does not appear possible now is because capitalism has been so horribly distorted. Capitalism was designed to be an open "playing field" for many small companies producing products that would compete for customer purchasing. The idea of the current, monolithic corporation that we have today is anathema to capitalism and is not in any way reflective of how the original system was supposed to operate. With many smaller companies competing, government regulation would have been more easily enforced and less complex making it somewhat less intrusive since the governance of a small company requires a lot less work than that of a huge conglomerate. With many small companies, capitalism could have achieved a normal sense of ebb and flow within the market place without the massive traumas that we currently experience since all such companies would have had less influence politically let alone within the market place. Capitalism was also not formulated around the "corporation" but around small companies or businesses whereby the owners were responsible for everything that happened to them. The corporation of today was actually designed to get around early capitalism's inherent limitations on wealth creation by actually being created as a scam that became banned for two centuries throughout Europe. Finance or debt capitalism is the economics of plunder. In the U.S., for instance, banks can lend out $100,000 for every $1,000 in deposits (or even more). When they get bailed out--do they get $1000 or $100,000? That money has to come from someplace. The U.S. dollar--basically a debt instrument--has a carrying charge by its nature. These interest payments come from someplace. Add in Sorosian currency speculation (taking whole nations to the "chop shop") and criminal fraudulent derivative instruments and you have additional layers of fraud. It's all sleight of hand. The poor never figure it out and if they do can do nothing about it.